Daily departure times: 8.30 (March - Mid-November), 9.30 (April – Mid-November), 10.00 (all year), 14.00 and 15.00 (End of March – end of October). We are comparing Ancient Rome and Colosseum Walking Tour Prices from leading ticket suppliers and Try to find you Cheap tickets prices on the market. Join a 3-hour guided walking tour of the Colosseum, Palatine Hill and Roman Forum and dive into the deep history of the Roman Empire. You'll meet with a friendly historian guide outside the Colosseum and receive fast track entry to this popular attraction. No need to waste your vacation in long queues! With this ticket you can breeze to the front of the line. Inside the Colosseum you'll be led to the same arena that brave man fought against ferocious beasts before a bloodthirsty audience. Relive these ancient times when you hear the stories and facts behind this 2,000+-year-old building. During this tour you'll also cross under the arch of Constantine to climb Palatine Hill which overlooks both the Colosseum and the Roman Forum. Take a stroll on the Via Sacra, where processions and took place many years ago. This was the originally the main entrance to the Roman Forum and the temple where the Great emperor Julius Caesar was cremated. Your tour will end here at the ancient site. If you're looking for a convenient tour which will let you skip the long entrance lines to some of Rome's top attractions then this is a perfect tour for you. The 3-hour will save you time but also take you on a thorough tour of the sites. Good for people interested in archaeology and the history of the Roman Empire. Your Experience With Ancient Rome and Colosseum Walking Tour? Visit the highlights of the Eternal City on a compact 3-hour walking tour. On a compact tour visit the ancient Roman Colosseum, Palatine Hill and the ruins of the Roman Forum. Explore the political seat of the Roman Empire and learn about the history. Hear the gory tales of Gladiators who fought in the Roman arena. Walk along the Sacred Way and enjoy the views from Palatine Hill. Enjoy the company of a qualified historian guide. Save time with fast track entrance tickets. What Ancient Rome and Colosseum Walking Tour Includes? Priority skip the line entrance to Rome Colosseum, Roman Forum and Palatine Hill. Book the early tour between June and August or during national holidays to avoid visiting the Colosseum during the busiest hours. Entrance to the Colosseum is free on the first Sunday of each month but it will be very crowded on these days. Be sure to charge your camera and bring your selfie stick! 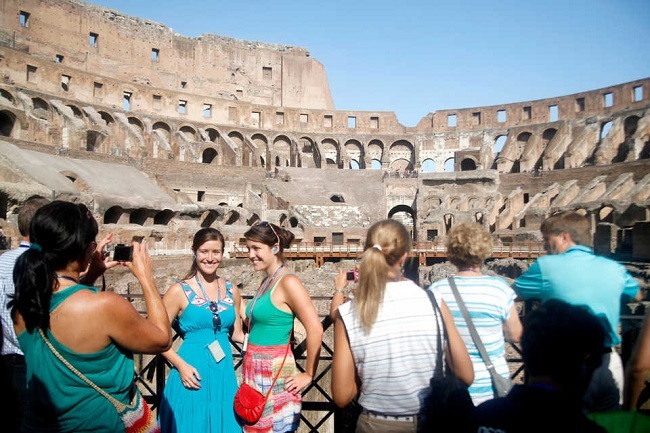 Travelers Reviews about Ancient Rome and Colosseum Walking Tour? The Ancient Rome Guided Tour has an impressive 4.8 out of 5-star rating on Get Your Guide from over 3,500 reviews. This tour is very highly rated on Viator and TripAdvisor with 5-star ratings on both sights. Reviews say that this is a fantastic tour, very convenient and led by informative guides. If you are not interested in history or archaeology then a shorter tour would be a better option for you. Bring electronic or printed ticket. Tickets are fully refundable up to 7 days in advance (or 24 hours in advance for some providers). Please wear comfortable shoes and be at meeting point 15 minutes early. This tour is available in English, German, French, Italian, Spanish, or Portuguese and tour may be in more than one language. Large bags/suitcases are not permitted inside the Colosseum. Meeting Point: Will be confirmed in the booking.